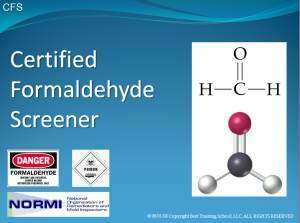 The Certified Formaldehyde Screening program is an online or self-study course that trains the IAQ Professional in techniques to screen for and then reduce formaldehyde contamination levels in indoor environments. The class covers the sources of formaldehyde, the deleterious health affects, and the solutions recommended to lower levels and manage the indoor air quality environment. This class is based on information provided by the US Department of Health and Human Services and other resources that are included in the class online or on CD. "Formaldehyde is a colorless, flammable gas at room temperature. It has a pungent, distinct odor and may cause a burning sensation to the eyes, nose, and lungs at high concentrations. Formaldehyde is also known as methanal, methylene oxide, oxymethylene, methylaldehyde, and oxomethane. Formaldehyde can react with many other chemicals, and it will break down into methanol (wood alcohol) and carbon monoxide at very high temperatures. Once the student completes this class, he is expected to pass a test evidencing his complete understanding of the issues surrounding formaldehyde and the techniques used to reduce formaldehyde levels on a permanent basis. After the student has completed the online quiz, he is encouraged to activate his membership (inactive membership is included in the cost of this class) by going to www.Join.NORMI.org so that he can take advantage of the benefits offered by NORMI to ACTIVE Members. Continuing Education every week is offered at NO CHARGE to all ACTIVE Members and a listing at the NORMIPro.com website is provided so that potential customers may be able to locate a CFS in their specific area of the county. Where is it found indoors? What are the MRL (Minimal Risk Levels)? a) How does it enter the body? b) What are the health affects? c) How does it affect children? What screening methods should you use? The NORMI CFS is given direction on how to research more information and, included in the CD or online course, is provided a 468 page document as a reference guide from the US Department of Health and Human Services. 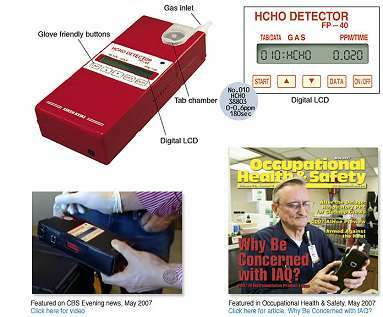 The goal of the CFS is to provide an ongoing IAQ Management program that will insure that levels of formaldehyde have been substantially reduced to levels below acceptable limits established by the EPA, NIOSH, OSHA, the World Health Organization, and the American Conference of Governmental and Industrial Hygienists.